This has been a season of almost continuously uninspired soccer. 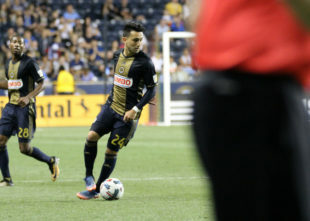 The high-priced veterans that were acquired by the team in the Earnie Stewart front office have been hit or miss – with an emphasis on miss. Counting the most significant signings since he’s been in charge have been: Haris Medunjanin, Chris Pontius, Anderson Conceicao, Illsinho, Jay Simpson, Charlie Davies, Fafa Picault, Oguchi Onyewu, Roland Alberg and Alejandro Bedoya. Of those 9, we should carry 4 into the next season. That is not a good percentage. The moneyball method that he employs either needs to be re-thought or scrapped altogether. That’s not to say that it’s all his fault. It could simply be a matter of the right man at the right position at the right price doesn’t exist. I’ve never played the game organizationally nor been tasked with assembling a team, especially under these circumstances. But someone has to be held accountable. The signings were only part of the plan though. The other part might actually be working. Despite the veteran woes, the team has actually drafted pretty well with players like Keegan Rosenberry, Fabian Herbers, Richie Marquez, Josh Yaro, Jack Elliott and of course, Andre Blake. Add them to the other up-and-comers like Adam Najem, Giliano Wijnaldum, Auston Trusty, Derrick Jones and Anthony Fontana and we might have the makings for a great core. Once they get established, good veteran signings could put this team over the top. Overall, there’s been a great influx of young talent with a lot of potential brought to the team and some playing in Bethlehem. We only need to give them a chance. I’m sure I’m not alone when I say an injection of youth could bring the energy this team needs to make a push for the playoffs. We’ve already seen what the veterans have to offer. A mixed bag. Let’s keep the proven stars on the field and give the young players a chance to shine at the other positions. Or at the least get some quality minutes. I’ve said before that we’re a small market team. I still think that’s a factor into their decision making. That excuse however, is going to wear thin very soon as the next season arrives and everyone else has stepped up their spending game. You either have to develop your young talent and let them play or buy the players to compete. Though they have promised to spend more in the offseason, that remains to be seen. It also gives the impression that they’ve given up on this season. Why not let the kids play? I’m begging you Earnie or Jim or whoever is keeping them on the bench. Please! At the very least we’ll have a new reason to watch the games. Who’s the 4th you’d keep out of that list of 9? After bedoya, fafa, and medunjanin, I’m struggling. Maybe ilsinho as a bench option (I can’t remember his price tag though), which I’d be okay with. I like Pontius, but we need more production from a player at that price point. Bedoya, Haris, Fafa, Simpson will be here next year. Not sure where you buy your adjectives, but “great core” of middling talent isn’t how I would think of them. Jones is the future and couldn’t grab a start in a meaningless game over Creavalle. Najem looks promising, but to what? What’s his ceiling? Marfan? Maybe a couple become starters, but starters on the 10th place team in the East. Also, not sure you can tag Pontius to Earnie, he was signed before Earnie started here. I do think from a “moneyball” perspective, getting Fafa and Gooch on a free is about as MB as you get. Multiple starts and significant minutes from both, with Gooch on a veteran minimum $65k salary. Honestly, given their price tags, I could honestly do without Bedoya and Medunjanin too. Not that they’re bad players, but I don’t think they’re a good use of limited resources. Fafa is the only one I can say should definitely come back, but he’s also the cheapest and youngest. If he was making the 400-500K most of those other guys are, I’d dump him too. Yeah, I was just referring to the 4 who are under contract for next year. This team tends to let contracts run out and let people drift away. Who I’d like to see back is a different story than who I believe will be here. Interestingly, I think Jim Curtin’s contract is up in December. If there were any media who still covered this Island of Misfit Toys, asking about Jimmy’s contract status would be fun to know. Can’t imagine he’s got a long list of salary demands for 10th place. Whoah, seriously? Is Curtin’s contract up? Why have we not heard more about this? Fafa will have a bad first game next year and be benched for the season. Once Fafa is benched we will slide Bedoya out to the left wing and start Warren in his place. Elliott will be slid to the left D so Yaro can start then after 5 or 6 games Elliot will be benched for sub-par performance. Eight games into the season we will be 1-5-2 and searching for a #10 to help us get back on track before the season is lost. I hope I am wrong…I really do. It would be funny if these things weren’t serious possibilities. Anyone who thinks you’re crazy, this time last year would you have thought Keegan and Marquez and such would have had the season they’ve had?